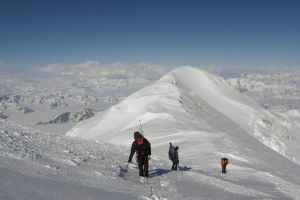 This peak is #3 on the Height List for Yukon Territory .This peak is the third highest summit of the Mount Logan massif, and is often the final objective for climbers ascending Mount Logans east ridge. It is often referred to as the "East Peak" of Logan. It consists of a east-west trending roof-top ridge that is usually ascended from the southeast. Name Notes: Named after the Stuart royal family of England. Charles Stuart (King Charles I) who was beheaded in March 1625. He engaged in a struggle for power with Parliament; he was an advocate of the divine right of kings. Some in Parliament, however, feared that he was attempting to gain absolute power. There was widespread opposition to many of his actions, especially the levying of taxes without Parliament's consent. The last years of Charles's reign were marked by the English Civil War; he was opposed by the forces of Parliament (which challenged his attempts to augment his own power) and by Puritans (who were hostile to his religious policies).